"The data from TPI showed what was wrong but I couldn’t figure out how to correct it," Harrington said of the swing flaw/change he says he has spent years trying to correct. "I could correct it in one off occasions but I couldn’t really get to the bottom of it over time. "Interestingly enough a lot of the work I was doing was at loggerheads with what I do with Bob. Bob concentrates heavily on the backswing and the start of the downswing and he still wanted to do that. But that went off and it went off horribly at the US Open because my focus wasn’t on it. "When I worked with Bob two months ago, Bob pointed out - which is why Bob is a genius - why I struggled so much to do the other thing." "In essence I cup my left wrist at impact with certain clubs, more with a driver. 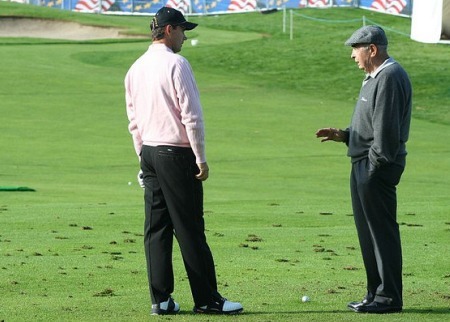 And while I was trying to stop doing it Bob said: 'Right, you just can’t do that with your grip.' Somebody with a strong grip just has to hold it off and somebody with a weak grip will release it and I was trying to release it." Like the splitting of the atom, Harrington's new swing change spewed out a long list of connected bells and whistles that didn't sound quite right. "He is a genius. He knows the sequence of what can and can’t be done and why some players will swing a club one way and anther player will swing it another way and why the can and can’t change the way they go about it. It is interesting that a lot of things came together in that period of time and over the winter I should get to grips with them." Having Torrance at the TPI in San Diego to talk over things with the rest of his bio-mechanical team should ensure that everyone is singing off the same hymn sheet next season. 'Harrington dumps Torrance' will not be making headlines any time soon. "Bob is still as much a part of the team - more so than ever," Harrington said in Dublin on Tuesday. "He is coming out to TPI with me for the first time when I finish up the season at Tiger’s tournament. The man is a genius." Asked if his well-chronicled woes were possibly as result of doing too much unsupervised tinkering, thousands of miles from Torrance, Harrington disagreed. "I speak to him all the time, even if I don’t see him. There is a difference in where my focus has gone in the last two years. When I am playing I don’t like working with a coach at a golf event. That’s basically it. Even when Bob is at a tournament that I am at, we only go through the pleasantries. We only work in between events." What happened at Turnberry went far beyond pleasantries. Surely Professor Bob had young Harrington in the golfing equivalent of Dunce's Corner during the Open? "Yes, we worked on things before the Open this year, but that is not a good sign. I am in trouble when I am doing it. That would answer that. If I am there, that is not a good sign. It means you are not going to win." There is no doubt that Harrington is similar to Tiger Woods in that he is coming closer to "owning" his swing and no longer needs as much warm up time to peak for an event. He still needs Bob but he also feels he has more control of what he is doing. "The minute I stopped (working on my swing 'improvement') I could put myself back on track, which was very encouraging for me. It was a big eye opener that I had that control over my game. When my priority was more to do with results, my results came back. When my priority was to do with trying to figure something out, it obviously showed up in my performance. And it was frustrating for people who were outside and didn’t have control." Had it not been for Torrance's late July intervention, one shudders to think where Harrington would be right now. He certainly wouldn't be looking at seven top 10s in his last eight starts. Padraig Harrington has finally solved the swing change “rant” that’s been driving him crazy for the best part of three years.